I am tremendously excited, and a bit anxious, about a recent opportunity I have been presented. Our school district is exploring the possibility of opening a “hybrid” school on our campus. 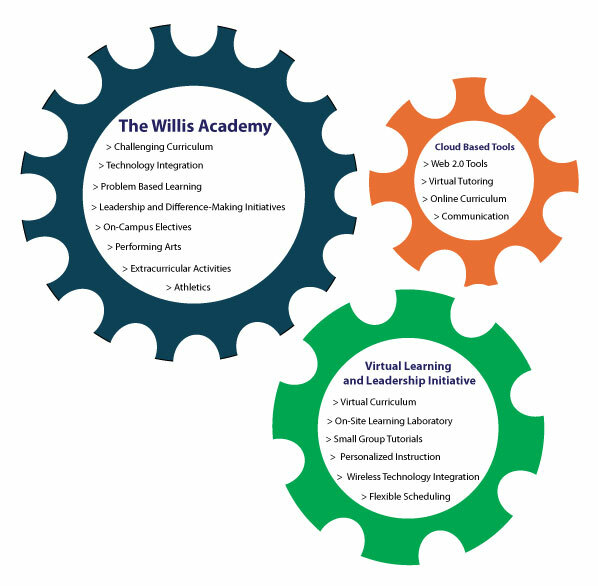 The school will combine virtual learning with on-campus instruction in an effort to highly individualize the learning experience for each individual student. We have been tasked with outlining a school model that we feel will effectively meet the needs of our student population–at this point, very few limits have been established. Our mission is to provide students with a technology intensive, individualized education that will prepare them to be problem solvers in the world community. In addition to a strong foundation in core curriculum, students will be encouraged to pursue individual interests and develop essential skills for success in a rapidly changing world–empathy, teamwork, creativity, leadership and change making. Initially, this hybrid school will operate as a “school within a school” — allowing students participating in the program to take advantage of activities on the traditional school campus. We also want to use this opportunity to enhance the utilization of technology on our traditional school campus and allow all of our students to take advantage of the benefits of virtual learning. As we begin working through this process, I would love to hear from those of you with experience in the hybrid, or virtual school realm. At this point, I am looking for models, resources and advice for beginning a school of this nature. I see this as an exciting opportunity to create a truly innovative school, putting into action many of the reform measures that I have heard discussed through #edchat and my PLN. Please feel free to chime in and let me know your thoughts. I think I will just give you a brief overview of what I do then let you decide if you want to know more. I actually have two jobs at my school. Half of my job includes teaching Social Studies at an alternative high school. This is a very small (40 students) school that is located in a new facility that is not called a school, but a technology center. We are a 1:1 school and both classrooms are “SMART” classroom which are outfitted with more technology than we know what to do with. While we did not set out to intentionally create a hybrid environment, that is what has happened. Let me explain. I have used Moodle for 5 years. I went from using it as a digital file cabinet to a place where I housed every part of my classes. When we adopted Google Apps for Education this year at my school it forced the other teachers who had not previously used Moodle with their f2f students to use it. (We use the single sign on for Moodle and Google so the only way to access Google is through Moodle.) The other teachers discovered what I knew all along. Being able to deliver content to students using Moodle saves so much time! It also allows students to work (at least to some degree) at their own pace. It is exciting to see other schools doing some of the same things we are doing at my school. Please let me know if you want to talk about my program. Hi, I just found this post – one of your Twitter followers. We have a hybrid school in NSW Australia. For the past five years we have offered online and blended courses, along with our face-to-face classes. We have 1200 day students and 350 online students who are typically doing a course online. It has been an interesting and fun journey. If we break out our online results from face to face students doing the same course, the online class on the average has higher class averages. Happy to talk further about our experience. We would be one of the few schools in Australia offering f2f, online and blended learning options. Although it is password protected, our online website, based on moodle, can be found at http://hsconline.nsw.edu.au.